Have you been to West Virginia’s six national parks? National parks offer incredible opportunities to experience history, explore the state’s natural beauty and venture to gorgeous places you’ve never seen before. A visit to any of these national parks will leave you with amazing memories you’ll never forget and a feeling that you can’t wait to visit and explore West Virginia again. Located at the confluence of the scenic Potomac and Shenandoah rivers, a visit to Harpers Ferry National Historical Park is a visit to the past. This quaint, historic community is full of unique experiences. Stroll the picturesque streets, hike the trails, explore the battlefield, and visit the parks incredible exhibits and museums. The park even offers historic trades workshops that focus on 19th century trades. Where else can you learn to make pies the same way they did back in 1860 or learn the historic trade of blacksmithing and understand how crucial this trade was to everyday life? Established in 1961, the Chesapeake and Ohio Canal Historical Park is located in D.C., Maryland and West Virginia. The C&O Canal operated for nearly 100 years and was used as a transportation route to haul coal, lumber and agricultural products. Today, it serves as a source for historical, natural and recreational experiences. While at the park, you can go boating, fishing, hiking, biking, horseback riding and more. Completed in 1937, the Appalachian Trail is a 2,180+ mile long public footpath that passes through Georgia, North Carolina, Tennessee, Virginia, West Virginia, Maryland, Pennsylvania, New Jersey, New York, Connecticut, Massachusetts, Vermont, New Hampshire and Maine. Four miles of the Appalachian Trail pass through historic Harpers Ferry, which is also home to the Appalachian Trail Conservancy – the trail’s headquarters. The trail in Harpers Ferry is perfect for everyone because it’s ranked easy to moderate and is just a few steps away from Harpers Ferry National Historical Park as well as the confluence of the Potomac and Shenandoah rivers. 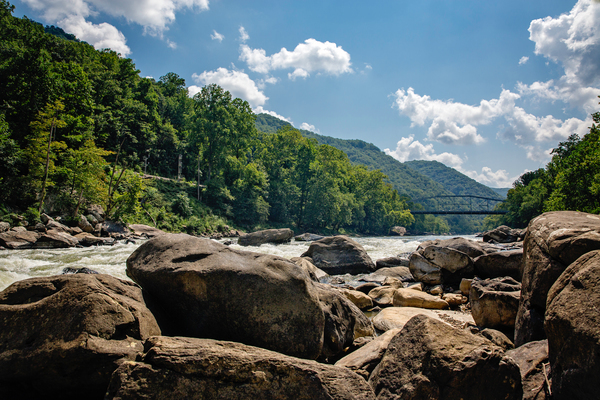 The New River is known for its rugged whitewater, but did you know it’s actually among the oldest rivers on Earth? Located in southern West Virginia, the New River Gorge National River encompasses over 70,000 acres and provides incredible scenery and stunning views. While visiting the river, you can climb, bike, hike, go whitewater rafting or simply take in the gorgeous views that surround you. Grandview, Sandstone Falls and the New River Gorge Bridge are all places you won’t want to miss out on experiencing. The beautiful, scenic Bluestone National Scenic Rivers headwaters begin at East River Mountain near Bluefield, Virginia and flow for 77 miles to Bluestone Lake near Hinton, West Virginia. The Bluestone National Scenic River is an amazing place to go hiking, mountain biking, hunting, fishing, birding, wildlife watching, canoeing and kayaking. For a unique experience, paddle the Bluestone River where you can find peace and quiet, scenic beauty and incredible access to wildlife. Located in the southern part of the Mountain State, the Gauley River National Recreation Area includes 25 miles of the mighty Gauley River and five miles of the Meadow River. The Gauley River is known for its scenic gorges, valleys and most importantly its class V+ rapids, making it one of the premier whitewater runs in the world. The Gauley River is also an incredible place for anglers to catch trout, small mouth bass, walleye and muskellunge. A visit to the Gauley River National Recreation Area will truly allow you to be at one with nature.